LondonJazz: NEWS: Extensive NYJO 50 Years video archive now available - and request for yet more! NEWS: Extensive NYJO 50 Years video archive now available - and request for yet more! October 10th 2015 marked the 50th anniversary of the first ever rehearsal of "The London Schools Jazz Orchestra," which later became the National Youth Jazz Orchestra at the Marquee Club in Wardour Street in London. As part of its anniversary celebrations, NYJO has been preparing an extensive video and photo archive on its website. So far, recordings from the first thirty of NYJO's fifty years are available. Bill Ashton OBE, the founder of NYJO has a wall of shelves full of VHS tapes containing various recordings of NYJO over the years. Before it becomes too difficult to play these tapes, it was important to get them digitised. What I found made my jaw drop! Revealed in the dusty VHS cases of off-air recordings, copies of domestic or corporate videos or early keen amateur videographer efforts was a truly amazing testimony of NYJO's story, the players that it helped develop and the players that helped develop it. It became clear that it would be possible to tell NYJO's story in pictures and sound. That was two years ago. Transferring and fixing up the material was a lengthy process and we gradually and discreetly built up the library on Youtube, but hid it. Now to commemorate the NYJO anniversary the library is being made available decade by decade together with historic photos, an Alumni list and Alumni bios via the NYJO website. The first three decades are now up. Once all five decades are up, more material and detail will be added in as it becomes available. There are around one hundred and fifty videos, some quite long of entire gigs, so we developed archive pages on the NYJO website organised decade by decade. NYJO has a recording history too, some forty albums and their covers and liner notes are used as stepping stones along the way. All the liner notes are readable. Together with the Alumni lists and bios being compiled by Steve Harris, also a NYJO Trustee we'll eventually get the history as complete as possible. 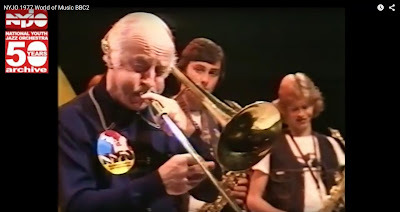 - 1977 saw the band being given an entire 'Magpie' programme to demonstrate big band jazz with a young Guy Barker in the trumpets and playing charts by Ken Gibson (LINK). - A clip from 1988 (above) shows trumpeter Gerard Presencer and drummer Chris Dagley both impossibly young in a NYJO small combo at ITV's Fun Factory dealing with a hyperactive presenter yet still delivering amazing jazz. Then there are the amateur and corporate recordings to do with various sponsorships and promotions. Many of these tapes show signs of wear and deterioration, some are copies of copies, and though some are off air recordings, they have been made to run as well as possible and given the NYJO 50year Archive logo to identify and deter commercial exploitation. It’s incredibly fortunate that Bill preserved so much, although it’s a task to organise and display along with all the photos it has been a revelation to me, a reminder of the scale of what Bill achieved and a great opportunity to get NYJO's story in one place. - A recording of the very first appearances of the London Schools Jazz Orchestra (a) on BBC2 Late Night Line up and (b) on a BBC News item.